Im a surgeon who's trying to compare two diagnostic tests that are used to diagnose appendicitis. Two diagnostic tests were applied on 150 patients and the results were compared to a gold standard. I understand that the sensitivities and specificities can be compared by using a McNemars chi square test. But what about the positive and negative predictive values... how do you compare these? Any help would be appreciated! eg. I found a relevant paper! Leisenring W, Alonzo T, Pepe MS. Comparisons of predictive values of binary medical diagnostic tests for paired designs. Biometrics 2000; 56:345-51. Where D is your reference standard and A and B are your two index tests (RIPASA and Alvarado). The full cross-tabulation is necessary. 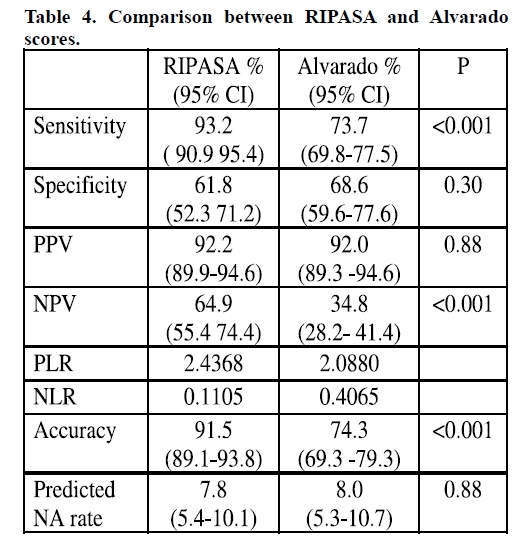 In this example the test on the left is superior according to the diagnostic likelihood ratios (labeled PLR & NLR) which are both further from 1. Diagnostic likelihood ratios, sensitivity and specificity are all significantly less sensitive to prevalence than PPV and NPV (which are both directly sensitive to prevalence) but they can still be affected if different prevalence in studies is due to spectrum bias. Of course, a simple comparison of point estimates is not satisfactory - the better test might have only been tested in a small population and there could be no statistically significant difference. Also you want to know whether they were both evaluated in representative samples (using a single gate [cohort or nested case-control] design). If you have multiple studies of each technique then a meta-analysis (using bivariate or HSROC method) may be appropriate. See chapter 10 (I think) of the Cochrane handbook for systematic reviews of diagnostic test accuracy. Finally, it could be that the diagnostically superior test is not acceptable to the same population as the inferior test. Better tests are often more expensive and more invasive, both factors which can render such tests poor for, e.g., screening. The paper you have mentioned is one of the best ways to compare predictive values of a diagnostic test and can be easily implemented using package DTComPair in R. A better statistic is "Weighted generalized score statistic" that can be implemented using same package but has an added advantage that it always reduces to commonly used score statistic when the samples are independent. Not the answer you're looking for? Browse other questions tagged diagnostic or ask your own question. Possible extensions to the default diagnostic plots for lm (in R and in general)? How to decide between quasi-poisson and negative binomial?